(Newser) – The 64-year-old woman who swam from Cuba to Florida is attempting to swim in a pool in midtown Manhattan for 48 straight hours to benefit victims of Superstorm Sandy. 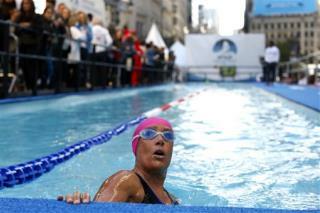 Wearing a pink swim cap, Diana Nyad dove into the 40-yard pool set up in Herald Square and began doing laps shortly before 9am today. Her aim is to raise money for people still struggling a year after Sandy. "It's going to be so magical to be out there," she said yesterday. "It's going to be a spectacle right in the middle of New York City." Please don't try to make the dog do the entire 48 hours! He's been through enough.